Welcome, EDH fanatics! Ravnica Allegiance is around the corner, and it’s great! I have the honor and privilege to present you with my review of the white, blue, and black cards that are not part of any guild (a.k.a guildless). Although one might expect that very few gems are saved for those guildless peasants, that couldn’t be farther from the truth! We’ll be looking at the cards that could add something new to the format, as well as an “honorable mentions” list at the end for cards that offer some neat redundancy for existing decks. There’s not enough time to go over every card, so we have to choose the most interesting. 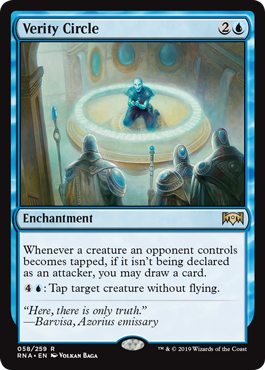 In other words, I am sorry if you think Sphinx of Foresight is an absolute Commander bomb. I will not feature him here! So, what do we feature? Smothering Tithe is a totally new effect for white. It fixes a bit of their mana issues in the flavorful form of taxing. Together with Dawn of Hope from the previous set, these cards are made in an effort to broaden the color pie and give white more tools in Commander. With both cards, we’ll have to wait and see how large their impact will be on our favorite format, and if similar cards will be printed in the future. As for Smothering Tithe itself, it combines nicely with cards like Mind’s Eye to create your own fixed version of Consecrated Sphinx. Others paying the tax for the Smothering Tithe is far less likely than paying for Rhystic Study (as the tax is higher and our benefit is lower), so I expect us to gain a sufficient amount of Treasure tokens from it. Pairing it Phelddagrif is my favorite hipster interaction. 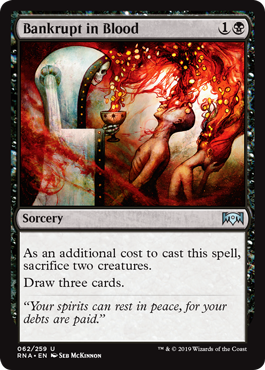 Pairing it with Anointed Procession is super cool. Pairing it with Wheel of Fortune will be far more common, and exceptionally powerful. Pairing it with Revel in Riches will be just plain awesome. Persistent Petitioners’s nickname at Wizards of the Coast was “Relentless Bureaucrats,” and we can see why. It is the fourth card with the Relentless Rats ability to run any number in your deck, and the first nonblack version. These cards spark all kinds of creativity within the Commander community, as breaking the singleton rule yields very interesting possibilities. So, which commander should helm this army of bureaucrats? You only need one copy of this creature for its effect to work, as long as you have three other Advisors. So using a commander like Grand Arbiter Augustin IV would further help us towards that goal, while also making the whole lot cheaper. Mass Appeal or Sphinx of the Chimes can then help with card draw when your hand becomes too flooded with the 1/3 creatures. To strengthen the mill theme, Phenax, God of Deception is another option. He makes the creatures useful while we wait for that fourth Advisor to arrive. Black also provides some tools like Shirei, Shizo’s Caretaker or Secret Salvage that can greatly improve the consistency of the deck. For more inspiration, look no further than an average Shadowborn Apostles deck. Another option is Brago, King Eternal; if he deals combat damage to a player, you can blink all your Advisors. As their abilities do not include a tap symbol, it can be activated even with summoning sickness! With this approach, it is also beneficial to also add cards like Eerie Interlude or Ghostway, for protection and redundancy. Finally, instead of milling your opponents, you could mill yourself! 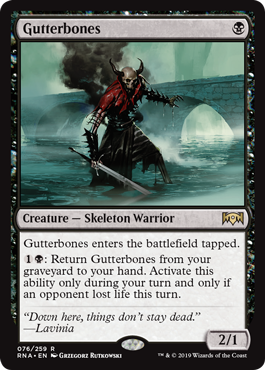 Self-mill strategies can fuel your graveyard for commanders like Muldrotha, the Gravetide. There are numerous ways to return a whole array of creatures from your graveyard, like Patriarch’s Bidding or Bloodbond March. Muldrotha provides the added benefit that she doesn’t need the Advisors to overwhelm your opponents. I think that an over-reliance on our relentless blue friends might be the biggest risk for constructing a deck like this, but it presents a fun twist. Needless to say, I like how a single common creature card provides so much opportunity within the format, and I hope Wizards will print more like it. Verity Circle is another effect unprecedented in Magic. Effects that care about tapping already exist, such as Gideon’s Avenger, but they care about tapping in general and not tapping without attacking specifically. Because of that specification, the reward for Verity Circle is stronger than normal. So the obvious question becomes: how can we abuse the ability? Derevi, Empyrial Tactician is the only legendary creature with a blue identity that can tap creatures himself. Being the 13th most popular commander on EDHREC, we can easily assume this tech will infiltrate the common Derevi list. 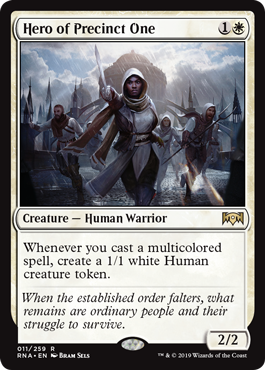 I’m not sure that particular commander was in dire need of new tools, but maybe in the not-so-distant future, we’ll get another legendary creature that can benefit heavily from Verity Circle. In the meantime, it’s a good meta call if you have a lot of opponents using Convoke or Azami, Lady of Scrolls! Chainer, Dementia Master. Probably one of the best options for Font of Agonies, since he can reanimate creatures like Gray Merchant of Asphodel to mitigate life loss. Erebos, God of the Dead, whose ability is used often and whose presence on the field is more resilient than any other commander in this list. Licia, Sanguine Tribune. Alas, this ability will only be activated once each turn cycle, but getting five counters per payment ain’t bad. Razaketh, the Foulblooded. Then again, he might not need Font of Agonies, because he’s able to fetch far more effective cards when he hits play. Savra, Queen of the Golgari can immediately regain her life payment, filling the Font with counters to knock out specific creatures when her opponents have too many tokens getting in the way of her Grave Pact ability. Selenia, Dark Angel’s need for Font of Agonies might depend on the way her deck is built, but often folks use her as a life-swap commander, paying all their life before Axis of Mortality-ing it away to someone else. Font can fill right up and help keep her protected from rogue creatures after paying all that life! Deathtouch on spells! Along with Soulfire Grand Master and Firesong and Sunspeaker, it makes you wonder what other ability words can be added to instants and sorceries. According to Head Designer Mark Rosewater, the answer seems to be: deathtouch, lifelink and on sorceries, flash. (Spells with trample are only possible on silver-bordered cards like Super-Duper Death Ray). Pestilent Spirit greatly benefits from a pairing with red instants and sorceries. Blazing Volley, Electrickery or Wail of the Nim, for example, become one-sided boardwipes. However, two bad cards forming one good effect still means that the cards alone are quite lackluster. Possibly Kazarov, Sengir Pureblood could abuse these effects by gaining a bunch of counters and clearing the field with Pestilent Spirit. As a bonus, here are a few other cards that interact nicely with our new Spirit. All these effects combined, at instant speed, for every player (even ourselves, if we would like). This card was obviously made for Commander, and players everywhere are already planning diabolical schemes with the Priest’s assistance. It does so many different things that it can’t help but find a place in many different decks. Of course, the biggest downside of the card is the tap ability, which means we’ll have to wait until our next turn before we can truly benefit from the grace of the forgotten gods. Then again, I think this is an advantage, as it will probably keep the cards out of other eternal formats, keeping the card affordable. Besides, the coolest of peoples know how to mitigate even this summoning sickness problem, because we play Garna, the Bloodflame like real professionals! 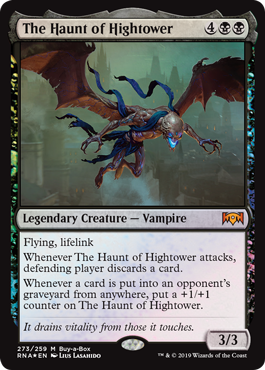 I am truly blessed, because even though I’m reviewing the guildless cards, I can still talk about a legendary creature: The Haunt of Hightower! The card is closest comparison is Vulturous Zombie, a Golgari card played in 2,845 decks. Their main difference, apart from its legendary status, is the addition of lifelink and the discard clause on attack. Although a discard deck is a possibility with this commander, my guess is we have better options for that (both in effectiveness and mana cost). So, what can we do instead? 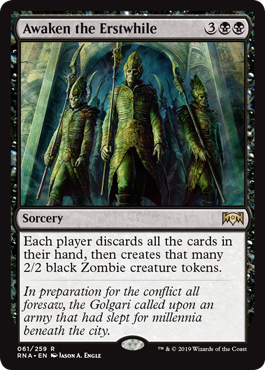 Vulturous Zombie is mostly played in self-mill and +1/+1 counter style decks, but that’s mainly because the Golgari guild handles those strategies so well. Where would The Haunt of Hightower shine? The clause “from anywhere” is the abusable part of this card. Milling an opponent is the easiest way to fill their graveyard. Depending on your exact mill strategy, this can give our lifelinking friend an enormous boost, so much so that it becomes a secondary (or primary?) win condition all on its own. Do you want to build a deck helming The Haunt of Hightower? Monoblack mill cards are easily found. Do you want to build another mill deck with The Haunt of Hightower as the 99? EDHREC has your back, bro. Mill away! These cards aren’t breaking new ground in EDH, but could certainly show up in the right decks. 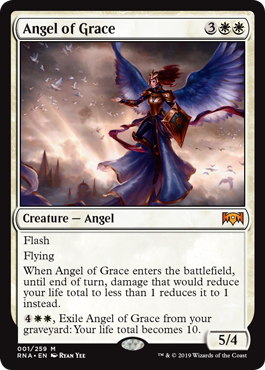 Angel of Grace is an obvious reference to Angel’s Grace (played in 1,741 decks), a card with partly the same effect. However, that card has a far cheaper mana cost then our Angel. It’s harder to leave 5 mana open than it is to leave a single mana open, and besides, staying at 1 life in a multiplayer format isn’t the safest place to be. Use the Angel for her flying body in an Angel deck like Lyra Dawnbringer, but she’s not the best Angel to have graced our format. Angelic Exaltation is the budget version of Sublime Archangel (played in 2,640 decks). It practically gives all your creatures Exalted, which can be amazing in the right deck. It does have the downside of making a wide deck go tall, something such a deck isn’t normally equipped for. Still, if the creature is not destroyed before it connects, this innocent-looking enchantment can do quite a lot of damage. 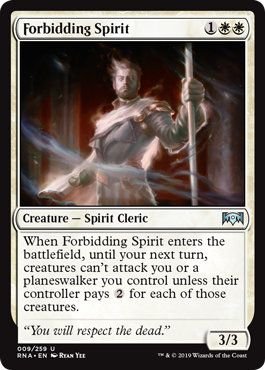 Forbidding Spirit is an enter-the-battlefield Ghostly Prison (played in 23,829 decks) effect. Once the ability resolves, however, there’s nothing your opponents can do to circumvent the effect (other than waiting out your next turn). 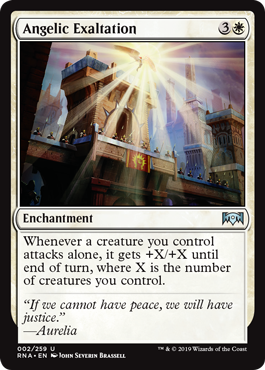 This might cause the card to be played in blink-heavy decks like Brago, King Eternal, who wouldn’t normally run Ghostly Prison or Windborn Muse. If you can stack multiple triggers, it’s pretty neat. Hero of Precinct One is interesting; a version of Young Pyromancer (played in 5,690 decks) that triggers of multicolored cards instead of instants and sorceries. I’m not sure if our hero has a place in Commander right now. My first instinct points to Ramos, Dragon Engine, but I’m not quite sure if he has a need for a lot of tokens. Lumbering Battlement is an Eerie Interlude on a stick. 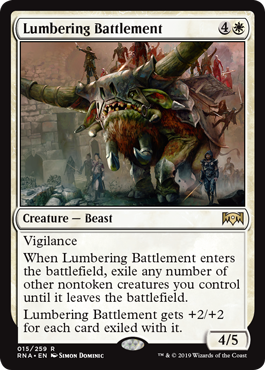 It provides white with a subtle answer to board wipes, by threatening to return a bunch of creatures if the great beast is eliminated, and in the meantime, it offers a big body that can stomp face and defend when necessary. Lumbering Battlement shines brightest in blink/flicker decks, because it can repeat your other ETB effects so handily, and gets really gross with other creatures like Restoration Angel. Its mana cost (and lack of evasion) might prevent it from being played in the more competitive metas, but I expect to see this card popping up in a deck or two. Eyes Everywhere reminds me of Avarice Totem (played in 373 decks). The important difference might be the sorcery speed, which means it’s less useful in reactive decks and can’t respond to its own trigger (to permanently gain control of a nonland permanent). On the flip side, Eyes Everywhere does have the added value of scrying every upkeep, as well as having blue mana in its activation cost; something not all decks can create. It should be noted that both abilities synergize nicely with Aminatou, the Fateshifter. Mass Manipulation is very expensive. X=1 will recreate a worse In Bolas’s Clutches (played in 461 decks). This effect is probably worth it from X=3, but at that point, you’re already investing 10 mana in this spell. 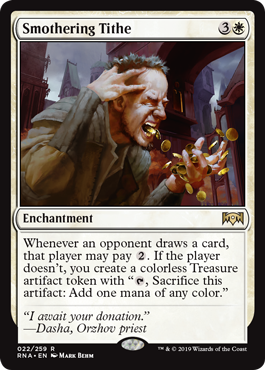 In that case, wouldn’t you rather play Blatant Thievery (played in 6,706 decks) or Rite of Replication (played in 22,630 deck)? Even Mizzix of the Izmagnus is probably hesitant because it uses up so much blue mana. All in all, not as good as it looks. 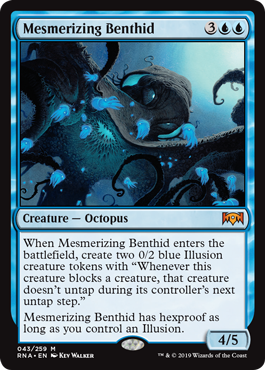 I love Mesmerizing Benthid. 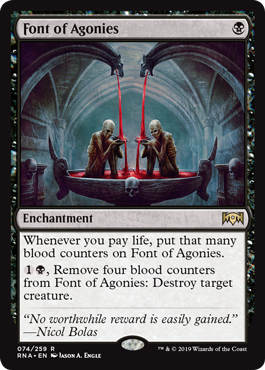 It is indeed mesmerizing… but I don’t think that makes it good enough to be included in your Commander deck. 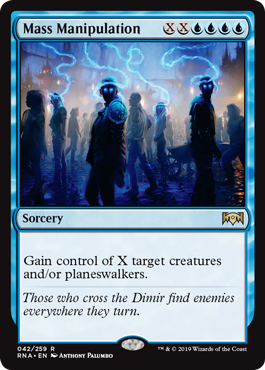 It creates three bodies on one card, which isn’t too common on blue creatures, but the impact of any of those bodies is negligible. A Brudiclad, Telchor Engineer might use it to its fullest potential, but I expect it will be relegated to sea-creatures-themed decks. Awaken the Erstwhile will see play in Zombie decks, where ruining your opponents’ plans works great with all the Zombie lords that ensure your army is more powerful than the tokens you give your enemies. Nath of the Gilt-Leaf is also in love, and Muldrotha the Gravetide doesn’t mind pitching her cards either. Another cool piece of tech is to use Awaken the Erstwhile in The Scorpion God, easily killing your opponents’ Zombies and drawing back the hand you previously lost. Oh, and Archfiend of Ifnir stacks very, very nicely with this effect, since it will trigger after the spell resolves and wipe out all the tokens your enemies just created! All that said, make sure you know what you’re doing when you cast this spell; the rest of the table is extremely likely to gang up on you with all their new creatures because they’ll all be mad that you got rid of their hands. Bankrupt in Blood is an extreme version of Altar’s Reap (played in 3,236 decks) at sorcery speed. The additional sacrifice might make it less reliable in nontoken decks, but I think dedicated token decks do not really mind. Meren of Clan Nel Toth and Mazirek, Kraul Death Priest are well-known for turning self-sacrifice into massize advantages, so I expect this to pop up here and there. 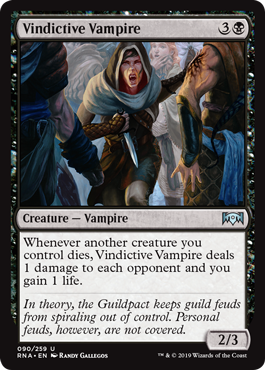 Vindictive Vampire is a combination of Falkenrath Noble (played in 6,755 decks) and Zulaport Cutthroat (12,035). It is also the fourth iteration of these effects, the other being Blood Artist, more popular than all its contemporaries combined. 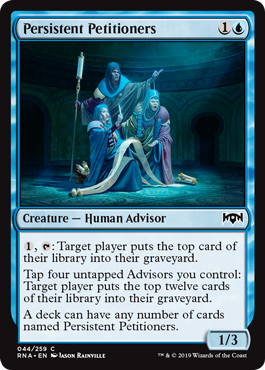 These cards are highly popular in Aristocrats strategies, so even though this doesn’t bring anything new to the table, rest assured that it will see play. That is the end of this review. What white, blue or black cards from Ravnica Allegiance did you like? Are there cards I didn’t review that you think will become popular? Is there an evaluation you disagree with? Comment below and we can figure out the best new homes for Ravnica’s new cards together!